As the leading optical component manufacturer from China, Shanghai Optics produces laser grade quality surface figure and surface quality. Our high standard of quality provides exceptional performance in demanding applications. For high energy laser applications, a 20-10 Shanghai Optics Laser Quality surface figured is highly recommended as its laser damage threshold is above 1J/cm2. These lenses are manufactured from MgF2 for UV/VIS/IR applications and are supplied coated or uncoated. Standard narrowband “V”-coat antireflection coatings are available, see ordering section below. When used to focus a collimated beam, the light should be incident on the curved surface of the lens. MgF2 lenses may be combined with other lenses to form different complex systems. 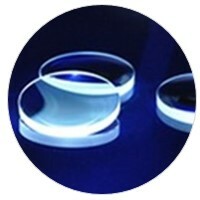 These spherical singlet lenses are manufactured from UV Grade fused silica and can be supplied AR coated or uncoated. Please call your Shanghai Optics sales engineer for pricing and delivery details.